I noticed this one flowering in a garden the other day. Fizz and I don’t really do gardens but we guessed that if it was flowering in the garden it would be doing so in the wild too and so yesterday we set out to capture some wild Ivy. 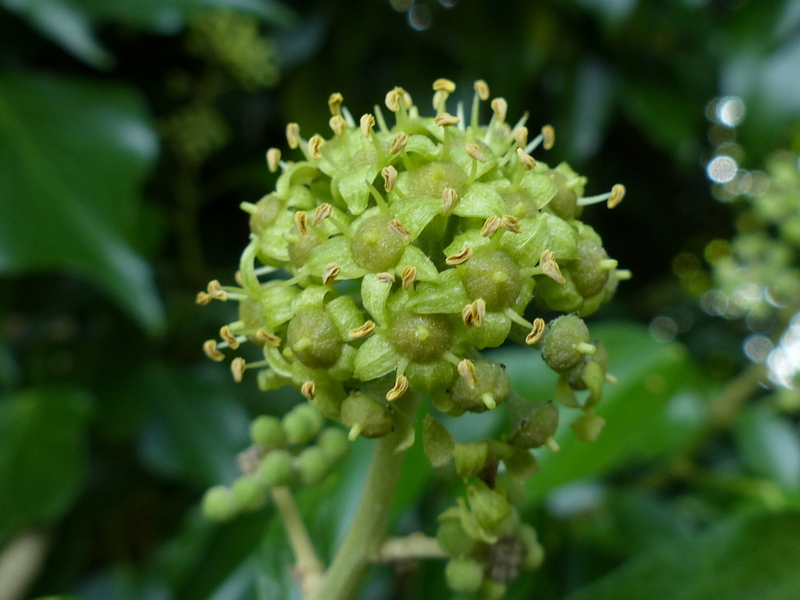 This is Common Ivy, Hedera helix also known as English Ivy or just Ivy. Well at least that is what it used to be. 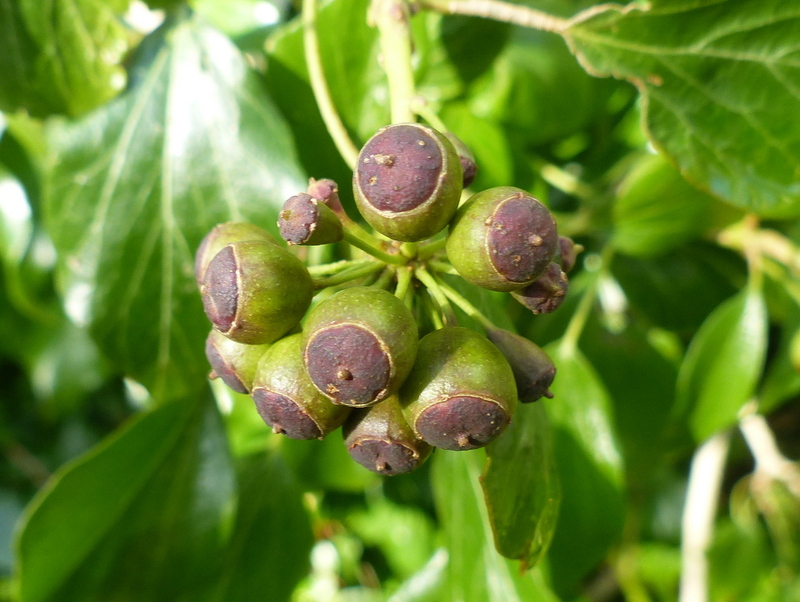 I have had a word with the experts and there are now apparently about fifteen different species in the Hedera genus. 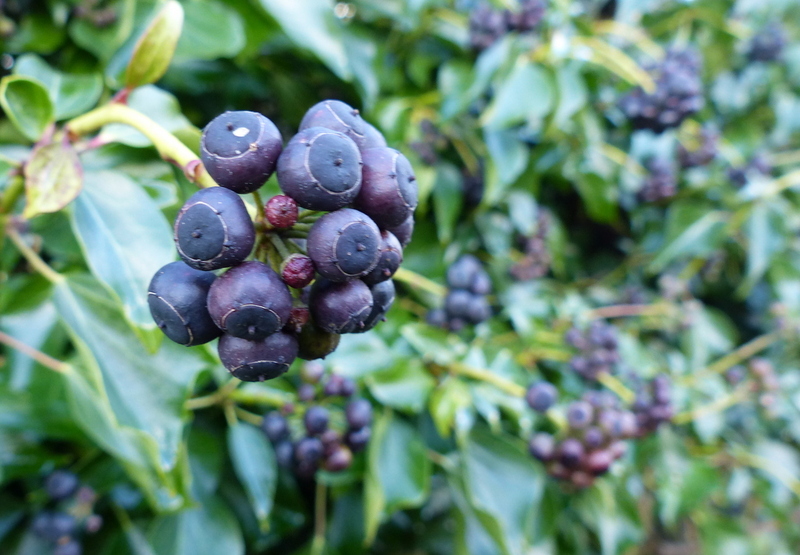 They can not agree between themselves exactly how many sub species there are and they all at one time or another were called Hedera helix but now you can’t actually recognise Ivy when you see it. Baloney is a type of sausage originating from Italy and very popular in the United States but that is a subject for another post. They look like little snow flakes just before they open. 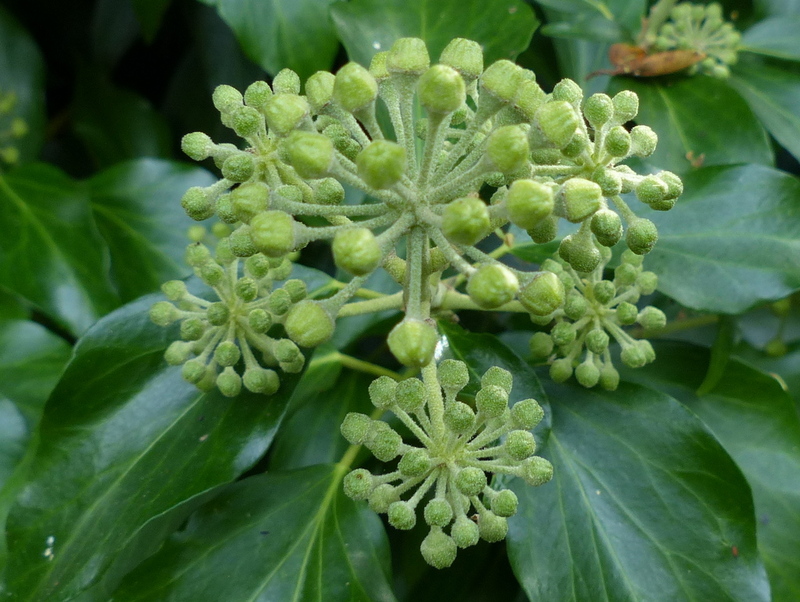 I know that this is not the most spectacular of flowers, being a very unspectacular green one but there is a very good reason for noticing the Ivy flowers. I shouldn’t really show you these next pictures. They were taken last January and there is precious little to photograph in January but this is the reason for noticing the flowers. 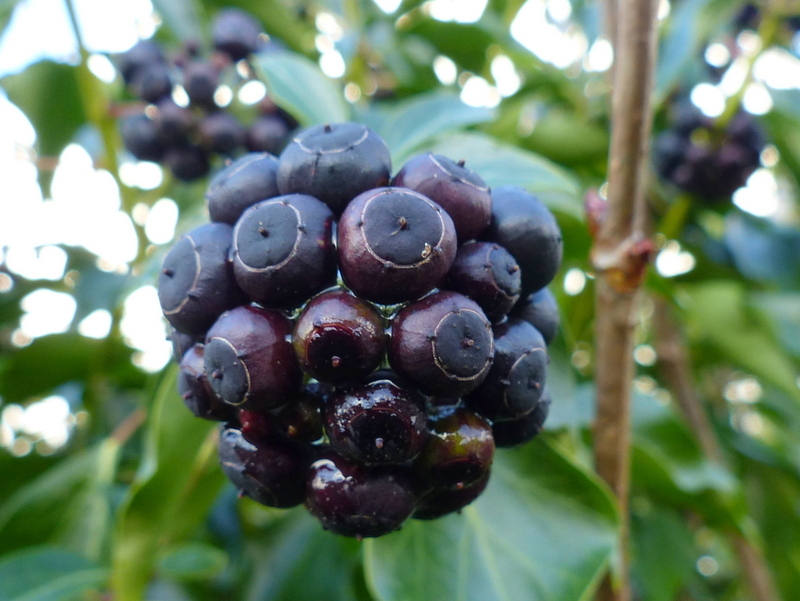 The beautiful berries are poisonous but this is one for the annoyers rather than the murderers, they are not highly toxic. All the same you should not eat them. Birds eat them. Yes it does. It harbours Bats as well and is a wonderful wild life plant for giving homes to many. 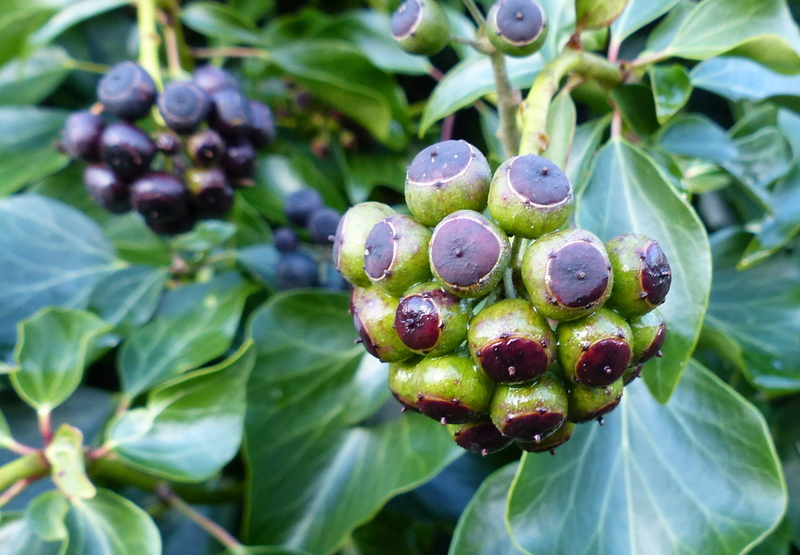 Ivy draws it’s nutrients from it’s roots and doesn’t take anything from the trees that it scrambles over. I know that people believe that Ivy chokes trees. I am not sure how it does this as trees do not have the same sort of respiratory system as Humans and are hard to strangle but I am not arguing. Dead wood is the single most important wild life habitat and a dead tree is much more useful than a live one but fortunately we can have both. I am not going to set myself against Mother Nature. If Ivy does kill trees then it takes a very long time to do so and ultimately it has done a good thing. That is natures way and many insects and birds will benefit. 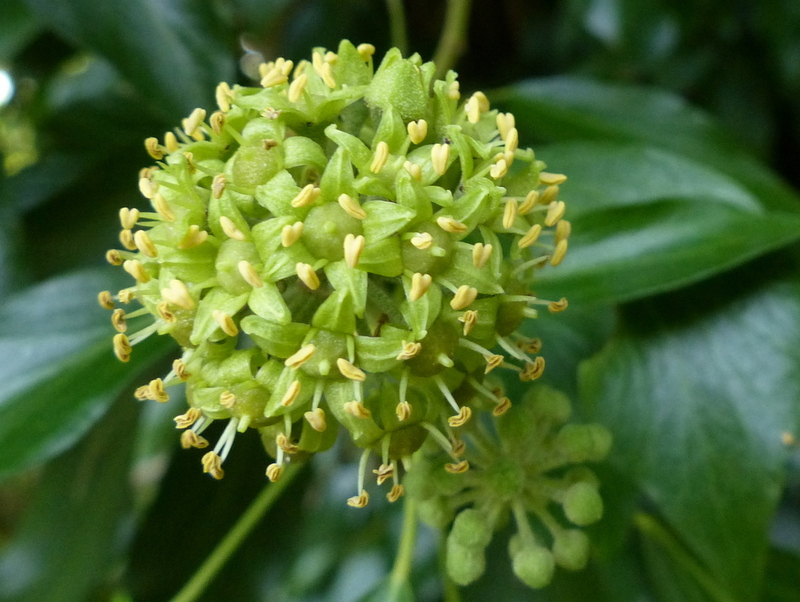 When I was taking these photographs the Ivy was buzzing very loudly. At first I thought that I had found a Bee’s nest but it wasn’t a nest, just hundreds of insects taking the nectar. Mostly Honey Bees but the animal in this next picture is a Dead Head Hover Fly. Beautiful little flowers from a lovely leaf that go on to be wonderful fruit. What more could we ask? Did you come across any Ivy Bees, Collettes hederae? Thanks Marc 🙂 Good question. To be honest I didn’t really look. The bees that ended up in my photographs all look like Honey Bees which is not surprising as we have a few hives close by but I should look and in a minute I will take Fizz back out there and focus on the bees. Many thanks. It is a no for now but the flowers are only just starting to open here. 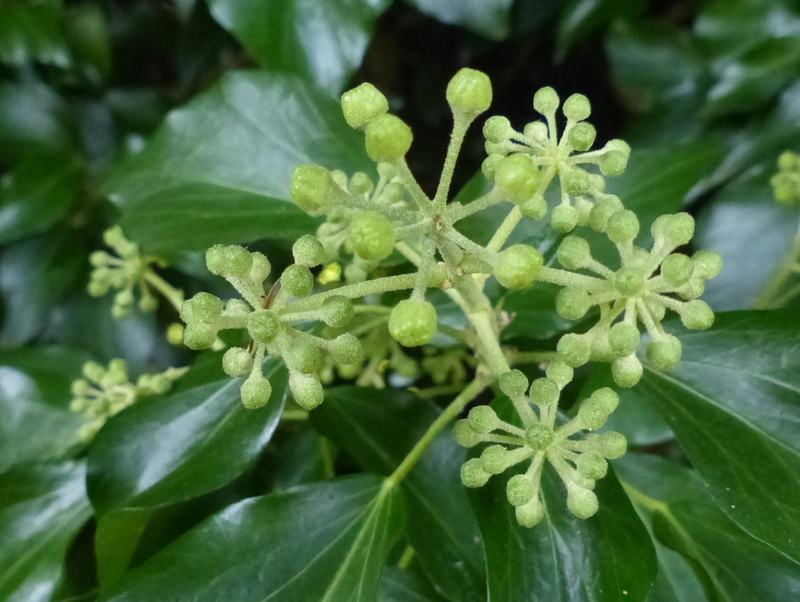 Just outside the farm there is a long stretch of hedgerow packed with ivy flowers that haven’t opened yet. It is crawling with different species but mostly Hover Flies at the moment. Further down the lane there are several good trees covered with ivy. A loud humming is coming from these trees but for now the open flowers are all high in the trees. I am only seeing honey bees here though. 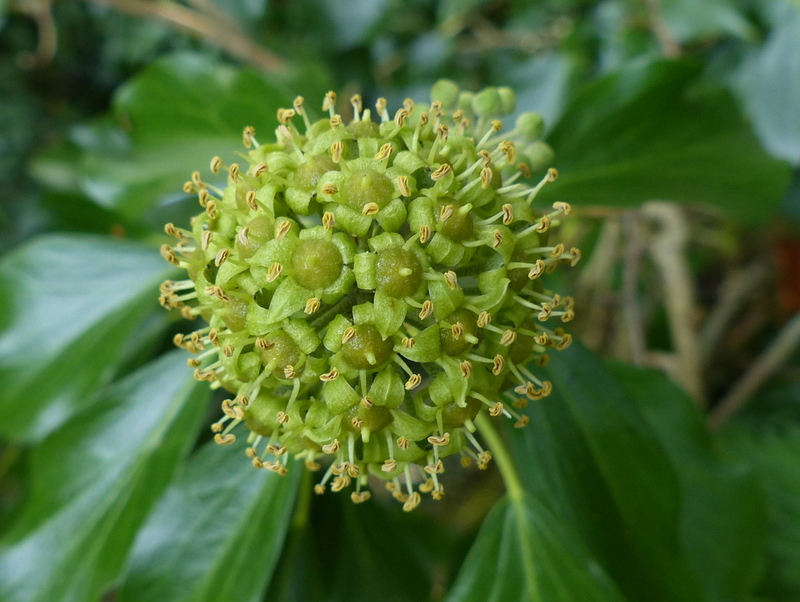 It is early, I will keep a close watch out for Ivy Bees, they would make a good post. I’ll look forward to reading all about them if you are lucky enough to find any. I keep honey bees and Ivy is one of the most important flowers for them. It flowers just when most of the summer blooms are over and is perfect for them to get the pollen and nectar for their winter stores. I like it so much, my beloved dog is called ‘Ivy’. I’ll also look out for Ivy Bees! 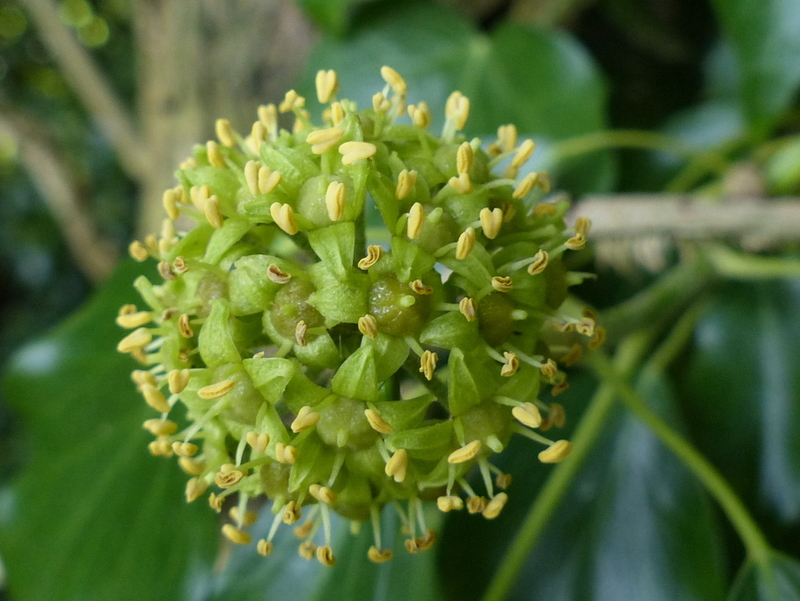 The wild ivy in our garden is buzzing with bees too. Thanks Clare 🙂 It would seem that late flowers are just as important as early ones. I have planted an ivy against the wall in my tiny HK garden. The ‘experts’ say it will not climb but it does not seem to have read the book. No flowers yet. Thanks Andrew 🙂 Ivy that will not climb? 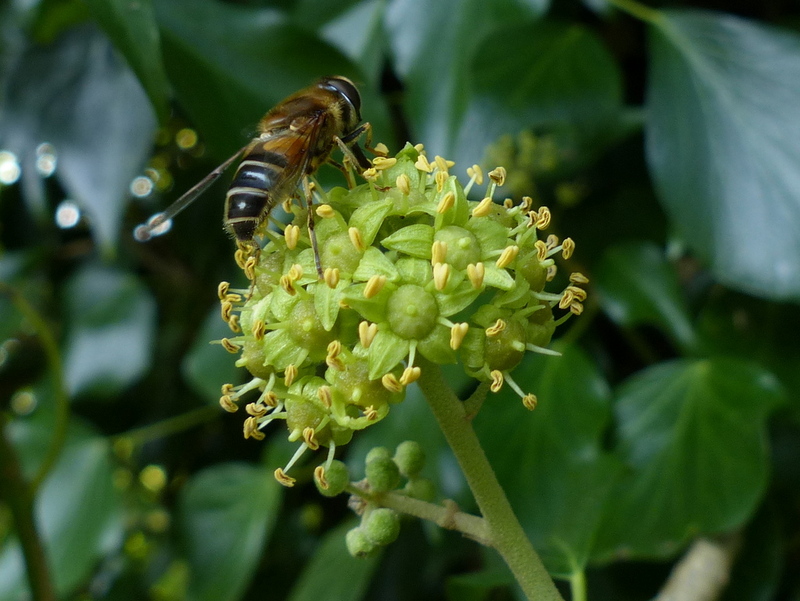 Mature ivy is a wonderful bee plant. Some dislike the bitter flavour of ivy honey but I quite enjoy it. It also has a lovely scent I believe. There is seemingly an abundance of Ivy around this year, at least in Cornwall where I’ve been holidaying over recent days. Can only be good news for our insect populations and berry-eating birds. 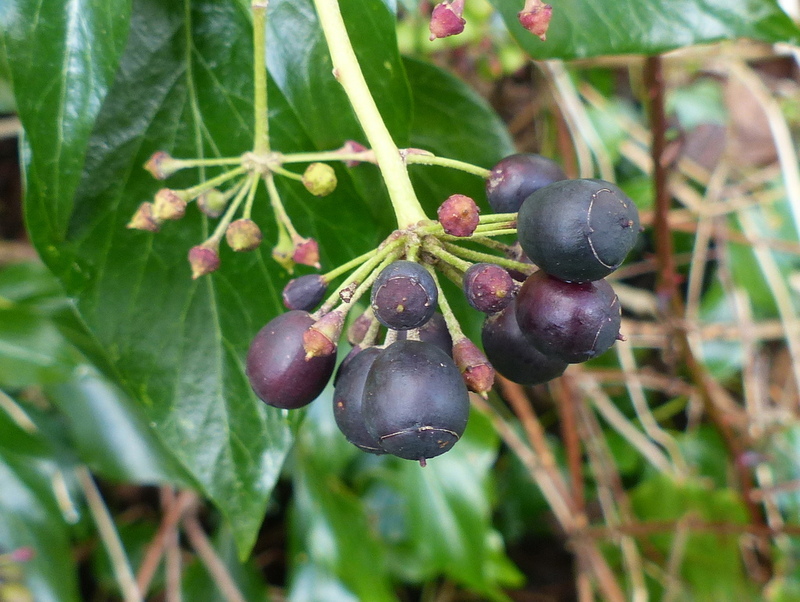 Just stumbled upon your blog whilst looking for the “correct” name for what I’ve always called Wild Ivy. Very interesting post & I couldn’t agree more with your comments. Now following!